- Rotation expected. Alexis and Lukaku confirmed to start. If the midfield doesn't hold up we have Herrera + Fellaini. If Dalot is having a bad game we have Turnaround Tony. Those 3 young lads deserve a bench spot. I'd personally start 1 of the 3 boys. I don't know enough youngsters to pick a team. I just hope Ole uses Academy lads in defence and at right back. Also McTominay should start this game and show his new manager if he can count on him. Like we were discussing recently, we have no backup to Matic and I would rather see McTominay given a shot there than FellateBee. - Fosu-Mensah has featured very little for Fulham. At Arsenal he played his first minutes of football in 2 months. Third season down the tubes for him. - Borthwick-Jackson thankfully is playing regularly for Scunthorpe. - Tuanzebe was a regular for Villa until 3 weeks ago. 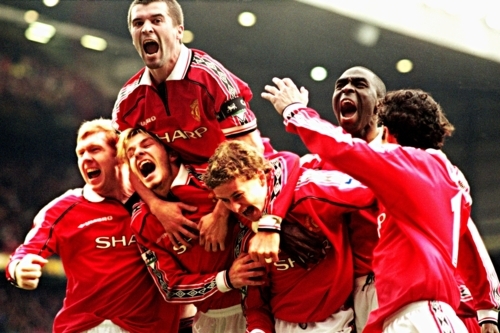 I wish Ole had these lads at his disposal and tried to see what they are truly made of. Jose just wrote them off in order to give second and third chances to Valencia and Jones. (04-01-2019 05:47 PM)Costas Wrote: I don't know enough youngsters to pick a team. I just hope Ole uses Academy lads in defence and at right back. Also McTominay should start this game and show his new manager if he can count on him. Like we were discussing recently, we have no backup to Matic and I would rather see McTominay given a shot there than FellateBee. I can't pretend to know vast amounts about your current youth but those are our best three graduates. Dalot has to feature at this level. While at left back, Our best youth option Ethan Laird is still 17 years old, word is he's capable and awesome unlike CBJ, but he's still in u18 level. I don't see how McTominay plays ever again let alone FA Cup, what about Fred? Perreira? Fellaini is not an Ole player, if he does, it's a squad role and these kind of scraps suit Fellaini and Utd more than a nothing player like Scott who is Jose's fraudulent grad. If it were me, Valencia is definitely sold, good thing Inter want him ! Jones off on a free and get rid of Rojo because Southampton/Wolves is his level. I hear Fellaini has admirers so I would hope we can pawn him off but .... we cannot sell till the summer. We can only afford to lose Valencia and Rojo....thats about it. (04-01-2019 05:47 PM)Costas Wrote: Tuanzebe was a regular for Villa until 3 weeks ago. Looks like he's out for 2+ months after foot surgery. (04-01-2019 06:57 PM)Clint-TheyCallMePapii Wrote: I can't pretend to know vast amounts about your current youth but those are our best three graduates. Don't buy the Valencia rumors, mate. They reek of his agent trying to get a new deal out of us. Why the hell would Inter be interested? Just like the time Real Madrid supposedly were after him? I really hope Ole, even if he stays by the end of the season, phases out Valencia, Jones and Rojo and puts them on the transfer list. These 3 have survived this long because every time they look to be gone, a new manager comes in who is reluctant to sell them before he gets to know them. Gosh, forgot about Dalot. Since this is our only option at LB, I guess we'll see Darmian and Dalot in the full back slots. Don't know if any of our Academy grads are ready to play, but I feel Lindelof needs a rest. Jones can play. Even if he gets injured, Smalling should be back by Spurs to replace him. Regarding McTominay, while he's been abject this season, I don't think he's that terrible. He could develop into a decent DM with the proper guidance (and he has Carrick for that now). I don't rate him above Fred and Andreas of course, but they are different midfielders. They are number 8s. Today they will probably start on the 2 midfield sides with Fellaini as the DM. Ah, thanks. I was wondering why he just stopped playing after starting every game for them. Romero - Dalot, Darmian (as a CB), Jones, Young - Andreas, McTominay, Fred - Mata, Heskaku, Sanchez. I was hoping to see Sheasy play. Signed up for a trial of ESPN+ to watch the match. To kill time beforehand watched the first half of George Best documentary. Needless to say I’m amped up for a pummeling! Our front three is worth more than their whole squad, we better see a good performance today. 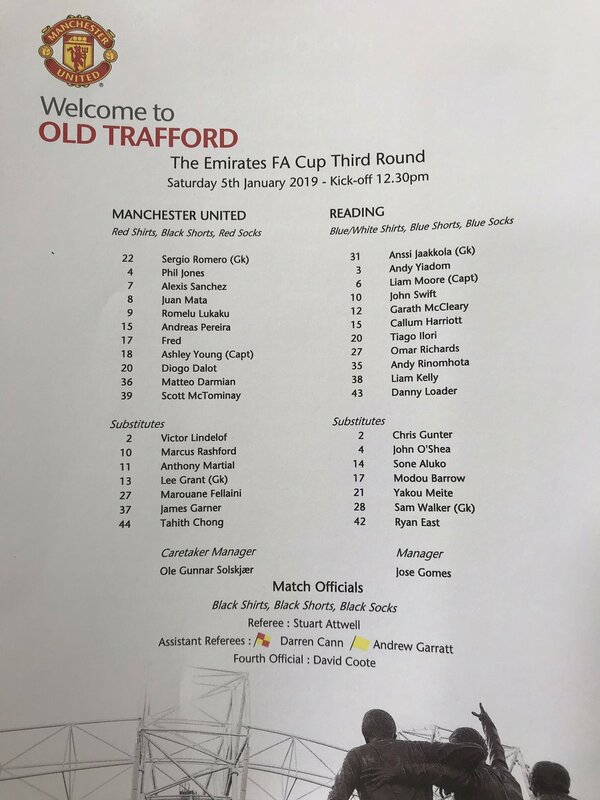 Turns out McTominay is playing on the right and Andreas is the DM. Ole is the second United manager to try this..
Offsides but wasn’t that a peno on Mata? Don't really deserve to be 2-0 up. We've been so disjointed in this game. the defence especially Darmian & Jones have been fine, the midfield trio is so garbage, and it's hard to asses the front 3 when they barely got ball at all. Dalot made a great defensive play to cover the goal while Romero pushed the player wide and prevented them converting. Seems like a smart defender to me for his age. The midfielders have been the weak link (although some of Lukaku's touches haven't helped his cause either). We're playing 3 guys in there who don't know what their best position is. I still don't get what Fred is supposed to be. Andreas plays as a DM again even though he played on the wing for Valencia. And McTominay is trying, but he looks out of sorts on the right. Now Ole has switched them around, so hopefully things will improve. never seen united midfield looks so disjointed as today. Disappointed in the players today. Expected more skill and there alot to prove for alot of them.